Every other person has considered having a tattoo, maybe not permanent but at least a temporary one. Absolutely painless application of drawings that can be altered in a couple of weeks is offered by Mehndi art – henna painting. Hiding from parching sun in refreshing shadows of palaces and escaping boredom, while men were shaping the future of states, noble women in ancient Egypt, Babylon, Greece, Assirya and India sought entertainment in the art of henna painting… Travelling around the world, penetrating various cultures and adjusting to their traditions, this type of body-art became deeply engrained in various lands therefore it is rather problematic to figure out Mehndi’s true birthplace. Findings in the shape of thousand-years-old Egyptian mummies testify to the popularity of bio-tattoo in those times. Researchers have discovered traces of the coloring composition on embalmed bodies that had spent over five thousand years peacefully lying in a sepulcher. Thus, Egyptian women used to cover their hands and faces with ornamental paintings while they decorated their husbands’ temples with images of hoopoe birds as a symbol of wisdom and wit. Another country competing for the title of the art’s founder is India. It was here where the term “Mehndi” originated and it was also here where archeologists found ancient petroglyphic engravings depicting Indian princesses with extremities fully adorned with distinctive paintings. Local women nowadays still ornament themselves with various patterns. Every other one regardless of age and status can boast to have either a blooming lotus or whimzical ethnic elements. Girls get their first henna-tattoos as early as at the age of three to four years. Citizens believe that these paintings done with natural material, aside from beauty and beneficial effect on skin, also work on a “delicate level” performing “cleaning” of chakras. Seven of them are considered to be major ones, they are dispersed along body’s major energy centers and find their reflection on palms that are decorated the most. Ornamentation was paid special attention by women from Arabic countries. Henna paintings didn’t serve merely as adornment but also as a talisman with the process of their application considered to be a certain ritual. Daily pictures were uncomplicated at all representing a simple pattern of swirls and dashes while on holidays and celebrations women used to decorate their bodies with more sophisticated motifs in shapes of flowers, leaves and geometric figures that compose exclusive arabesques. Tattoos for brides used to be paid special attention. Most often their application was taking both hands of more than one skilled painter and a several days time. 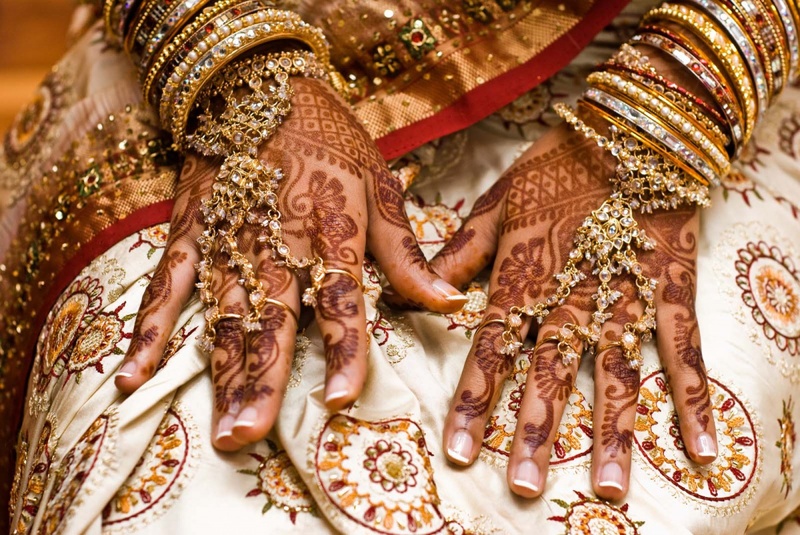 Mehndi traditions here as well as in India remained almost intact. 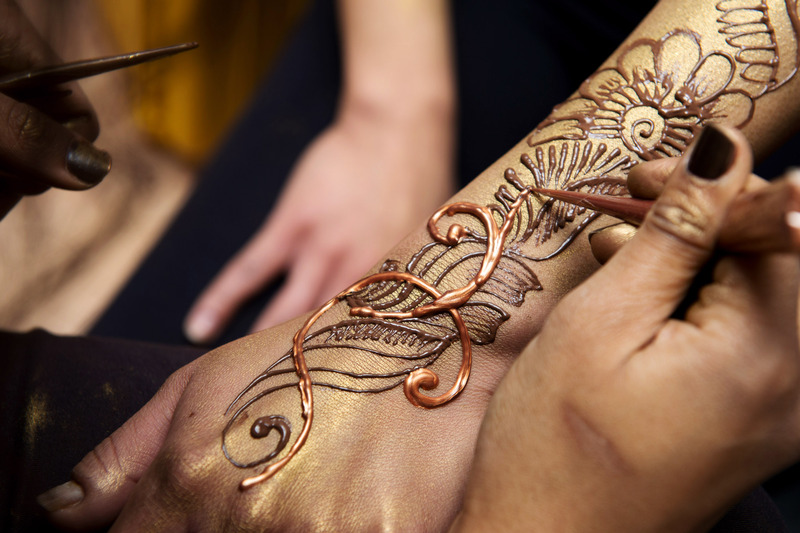 Henna decoration is included to standard procedures list in many beauty salons alongside hairdos, makeup and manicure. In wedding season and national holidays these establishments significantly extend their working hours trying to paint as many hands and legs as possible. Mehndi didn’t gain as much popularity in Europe as it did in the East in those times. Durable paint transportation that significantly decreases its quality, Church’s disapproval of the decoration together with increasing relevance of long-lasting tattoos significantly delayed period of henna popularization, as long as till 1990s. Having had enough of life-long tattoos and piercing, Europeans and Americans embarked on a search for blander and less “permanent” adornment. It was then when they recalled natural dye. A painting made with a blend of good quality lasts for about a month and the procedure itself is absolutely painless and hygienic. Besides, due to its natural origins, henna exerts favorable effect on skin. Its main benefit is antipyrotic action that was noticed in the very same East. Before sun protection cream was invented, it was henna that Bedouins, who were wandering in deserts for months and months, used to cover their hands and faces with. Travelers weren’t particularly thinking about drawings and their meaning (and who other than camels would have appreciated them), so they were simply dipping their hands into a dye-liqour. Mehndi application technology in Europe isn’t much different from eastern one while designs diversity increased significantly. Traditional styles and motifs with complementing trends like images of zodiac signs and meaningful inscriptions created new patterns that enjoy popularity as a stylish accessory for parties and feasts. One of the world’s best masters in Mehndi art, by the way, became a European. The United Kingdom citizen Ash Kumar in 2001 even managed to proudly get his own line in Guinness World Records when he managed to paint as many as 96 hands with good quality drawings in one hour.